WASHINGTON (Dec. 18, 2010)--The Humane Society of the United States and the Humane Society Legislative Fund applaud President Barack Obama for signing an important bipartisan bill to protect consumers and animals. The Truth in Fur Labeling Act (H.R. 2480), which passed the House of Representatives in July and the Senate in early December, will bring much-needed accuracy and disclosure to fur products. The legislation closes a loophole in federal law that currently allows some animal fur garments to go unlabeled if the value of the fur is $150 or less, leaving consumers in the dark as to whether they are buying faux or animal fur. HSUS investigations have found jackets trimmed with animal fur being sold across the country without labels or falsely advertised as "faux fur." 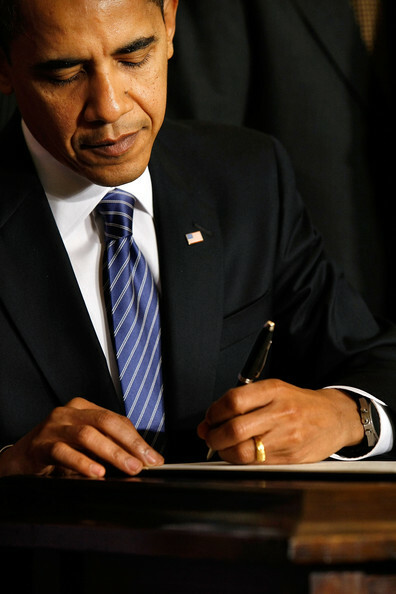 "By signing this legislation, President Obama has given consumers who choose to avoid real animal fur for moral reasons a valuable tool," said Wayne Pacelle, president and CEO of The HSUS. "The Truth in Fur Labeling Act will protect shoppers by requiring all garments containing animal fur to be accurately labeled." The HSUS and HSLF also expressed their thanks to the sponsors of this legislation—Sens. Robert Menendez, D-N.J., Susan Collins, R-Maine, and David Vitter, R-La., and Reps. Jim Moran, D-Va., Mary Bono Mack, R-Calif., and Ed Whitfield, R-Ky.—for their leadership on this critical animal welfare and consumer protection issue, and to House and Senate leaders for working to bring the bill over the finish line in Congress. Gucci Group, Burberry, Macy's, Bloomingdale's, Saks Fifth Avenue, Buffalo Exchange, Overstock.com, Ed Hardy, Victoria Bartlett, Charlotte Ronson, and Andrew Marc, among other retailers and designers, have endorsed closing the fur labeling loophole. An HSUS investigation found raccoon dog fur on more than two-thirds of a nationwide sample of fur-trimmed jackets purchased from well-known retailers and designers. Of the raccoon dog fur jackets tested, not a single one properly identified the animal in advertising or labeling, instead calling it such things as faux fur, raccoon, or simply not labeling it at all. H.R. 2480 had 171 bipartisan cosponsors in the House, and S. 1076 had 34 bipartisan cosponsors in the Senate. The Dog and Cat Protection Act of 2000 banned the trade in domestic dog and cat fur after an HSUS investigation revealed the gruesome deaths of 2 million dogs and cats a year in China and other parts of Asia for the fur trade and found domestic dog and cat fur for sale in the United States. The HSUS later found domestic dog fur slipping into the country on unlabeled jackets. The HSUS testified in favor of the Truth in Fur Labeling Act at a House subcommittee hearing on May 13.